Gary Scavone (soprano) specializes in the performance of contemporary concert music and encourages new works incorporating the saxophone. He studied saxophone with Ronald Caravan and Sigurd Rascher at Syracuse University, as well as with Jean-Marie Londeix at the National Conservatory of France in Bordeaux while on a Fulbright Scholarship. He is a former member of the Aeolian Saxophone Quartet and the New York Chamber Saxophones, and often played with the San Francisco Saxophone Quartet while living in the San Francisco Bay area. Dr. Scavone is currently Associate Professor of Music Technology at McGill University in Montreal, Canada. Northern New York native Todd W. Pray serves as the High School and Middle School Band Director at Peru Central School, where he conducts High School and Middle School Bands, directs the Jazz, Marching, and Pep Bands, and teaches Music Theory, Music Appreciation, and small group instrument lessons to students in grades 6-12. He served as Adjunct Faculty/Saxophone Instructor at SUNY Plattsburgh in 2004-05, and maintains a private saxophone studio made up of students of all ages. 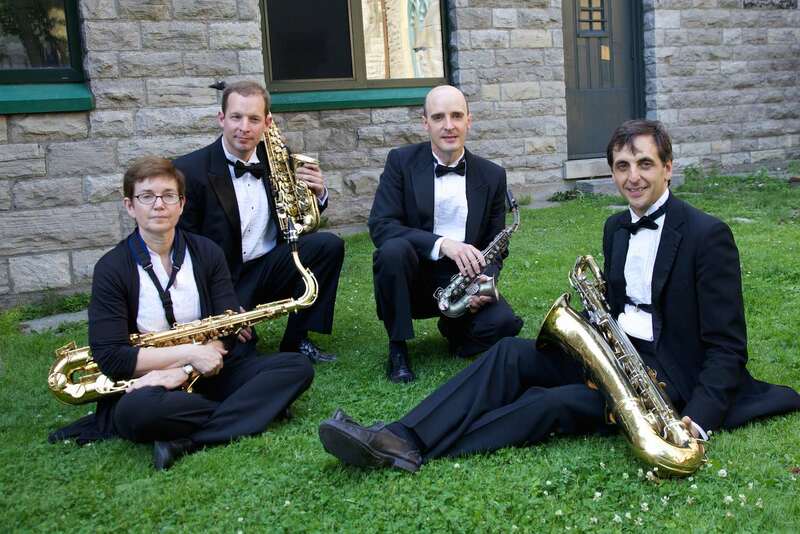 Aside from his teaching career, Pray maintains an active performance schedule, regularly appearing with the Adirondack Wind Ensemble (AWE), Frontier Saxophone Quartet, and Adirondack Jazz Orchestra (AJO). It was in preparation for the first AWE performance that Mr. Gordon and Mr. Pray began discussing the formation of a professional saxophone quartet, which soon became the Frontier Quartet. Pray also appears periodically as guest soloist, conductor, or woodwind player for a wide variety of ensembles. He has been fortunate enough to play in Alice Tully Hall at New York City's Lincoln Center, and other performances with various ensembles have taken him on tours through Maryland, Virginia, and New York State. Mr. Pray received his Master's Degree in Saxophone Performance and Bachelor's Degree in Music Education from the Ithaca College School of Music in Ithaca, NY, while studying with Dr. Steven Mauk. He also holds an Associate's Degree in Music Education and Performance from Schenectady County Community College in Schenectady, NY, where he studied with saxophonist, clarinetist, and conductor Mr. Brett Wery. Linda Sullivan (tenor) received her Bachelor of Music from SUNY Potsdam and her Masters of Music Education from the University of North Texas in Denton, TX. She has studied with James Stoltie, James Riggs, and Debra Richtmeyer. She retired in 2014 after 33 years teaching instrumental music for the Plattsburgh City School District. Linda is active in the New York State School Music Association (NYSSMA) as the chairperson of the Constitution Committee and a former member of the Curriculum Committee. She was involved in the Curriculum Committee's most recent project, "A Sequential Guide to Music Instruction." Linda is also an All-State Certified Woodwind Adjudicator for NYSSMA and has served as a guest conductor for music festivals in New York and Vermont. Linda performs locally with the Adirondack Wind Ensemble and the Adirondack Jazz Orchestra. Daniel Gordon (baritone) has been a member of the music faculty at Plattsburgh State University since 1994. His responsibilities include teaching studio saxophone, directing the Saxophone Ensemble and Symphonic Band, and instructing various classroom courses. Gordon's credits as a saxophonist and conductor include appearances at Alice Tully Hall and Bruno Walter Auditorium at New York City's Lincoln Center, the American Embassy in Paris, the Circle of Fine Arts in Madrid, Pollack and Redpath Halls in Montreal, the Kuhmo Chamber Music Hall in Finland, and several smaller venues in Italy, Spain, Finland, France, Canada, and the US. During the summers of 1997-1999, he was part of the saxophone teaching corps at the Domaine Forget International Music Festival along with the renowned saxophone virtuoso Jean-Marie Londeix, with whom he had studied at the National Conservatory of France in Bordeaux under the auspices of a Fulbright Scholarship. He has been the saxophone instructor at the Suomen Työväenmusiikkiliitto summer festival in Finland since 2005. Gordon's associations with the other performers in the quartet go back many years. Todd Pray is a charter member of the saxophone section in the Adirondack Wind Ensemble, a professional performing ensemble that Gordon founded in 2002. Gordon has worked with Pray's former teacher, Steven Mauk, on several projects over the last 25 years. Claudia Schaetzle has worked with Gordon for the past several years after being introduced by former SUNY Plattsburgh pianist Pamela Reimer. Schaetzle studied with the same teacher as did Gordon and Gary Scavone in France, and has worked with many of the same saxophonists as Gordon has over the last two decades. And Gordon and Gary Scavone were undergraduates together at Syracuse University in the mid 1980s, where, inspired by their admiration and respect for their teacher, Ronald Caravan, they spent hour after hour playing duets in the basement of Crouse College. A few years later, they took that act on the road and traveled together as street musicians through 13 European countries over two summers. Gordon's book about those experiences, Sax on the Streets: Confessions of an American Street Musician in Europe, was recently published by SynergEbooks. It can be purchased online at writeronlinebooks.com.